Today would have been my grandmother’s birthday. She was a pioneer in many ways, including in her decision to serve her country during World War II well before women were allowed to serve alongside men in the military. She served as a radio operator in the U.S. Navy’s Women Accepted for Volunteer Emergency Service (WAVES) division, which helped pave the way for women to one day be accepted for military service in more than just an “emergency” capacity. My grandmother was an amazing woman and one of my real-life heroines. I wish I had a photograph of her in her WAVES uniform. Sadly, I don’t think such a photograph exists. So, in honor of her service to her country, I decided to dedicate today’s Doctober entry to her. 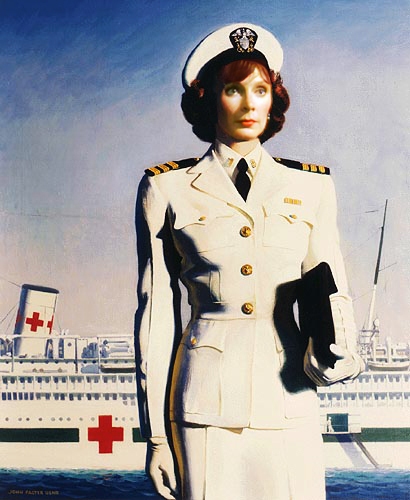 Therefore, I give you Commander Beverly Crusher of the WAVES Hospital Corps (yes, I added a couple of stripes to her shoulder boards to promote her from ensign to her proper rank of commander [even though I don’t think a woman would have ever been allowed to rise this high in rank at that time]; hopefully, I didn’t miss anything else while I was tweaking). I offer this with pure respect and admiration, not only to my grandmother but to every woman who defied convention and societal mores to step forward and serve their country, even when their country disapproved. Thank you for everything you did for those daughters and granddaughters who would one day attempt to follow in your awe-inspiring footsteps. If you’d like to see the original version of this poster, along with several other amazing posters, head on over to the Navy’s “Recruiting Posters for Women from World War II – The WAVES” section.